To view the list of your referrals, select Partnership → Referrals in My FXOpen. The data in the table is filtered according to the specified parameters. You can choose the period during which FXOpen clients became your referrals by following your referral link (From and To). If you want to find a specific referral, enter the eWallet number or trading account number in the Account field, and then click Show. 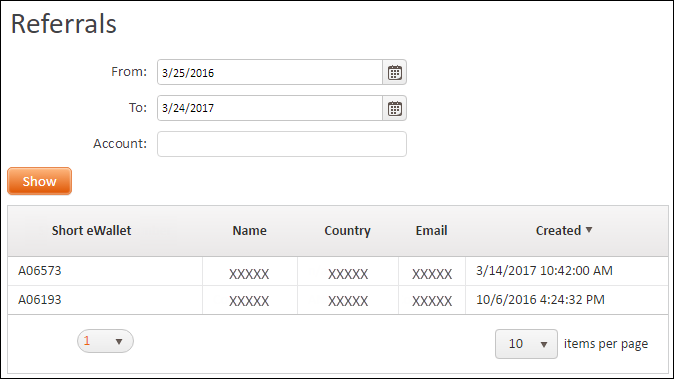 Created: Date and time when this FXOpen client became your referral, that is, registered an account by clicking your referral link. You start receiving partner commission from this date.